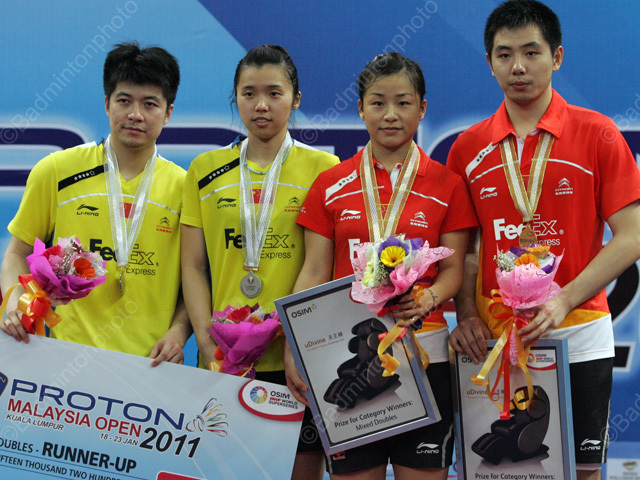 China swept four golds in the Malaysia Open to become the big winner of the first leg of the 2011 Super Series. Though all but the men’s doubles had been in the bag since Saturday or earlier, the superpower’s top stars served up some brilliant badminton all Sunday afternoon. The mixed doubles final between Tao Jiaming / Tian Qing and He Hanbin / Ma Jin (pictured), started with a few fast and quick rallies. After the interval, He/Ma continued to run up a 15-9 lead, their dominance punctuated by Ma’s hard smash to Tian’s body. Tao/Tian, after performing badly and giving the first game easily to He/Ma, pulled themselves together in the second. When He/Ma was down at 13-20, He hit the shuttle long and gave Tao/Tian the opportunity to force a rubber game. When Tao/Tian were leading at 13-12 in the third game, Tao did a brilliant low cross court shot with his backhand but Ma seemed to be onto his tricks by then and got the shuttle back. Tao did almost all the attacking in the third game while Tian did almost all the defense today, but this is still not enough as He/Ma seemed to be better today and they celebrated their victory after winning 21-16 in the third game. “We tried to keep a positive mindset even though we were trailing,” He said of his side’s amazing comeback, via an 8-point run from 12-14 down in the decider. “I won this title three years ago when I was still one of the younger members of the team, but now I am one of the senior members, and this win has proven that I still have the ability to win at a tournament. It boosts my confidence,” He said of winning his second Malaysian title. In the women’s singles final today, Wang Shixian (pictured) defeated her team-mate and the current world no.1 Wang Yihan in two straight games to win her first title of the 2011 Super Series, right after another superb win at the Super Series Final in Chinese Taipei two weeks ago. Most of the points won by Shixian today were on the errors from Wang Yihan, especially in the second game. In today’s match, Shixian had more variety and decisive shots compared to Yihan. Yihan had a lot of golden opportunities to kill off, but she has just missed too many, with devastating consequences for her confidence. “The match was actually not that easy, although I was leading in the first game. I think too much when I am leading,” said Shixian after her victory. The women’s doubles final was the repeat of Asian Games last year. However, the almost unbeatable pair last year Yu Yang/Wang Xiaoli failed to get their revenge as they lost to their teammates, Asian Games Champions Zhao Yunlei/Tian Qing (picture NL7C2993). After Zhao/Tian controlled the first game well and took it convincingly 21-12, Yu/Wang took things more seriously in the second game and turned the table around to win at 21-6. Both pairs got down to business in the third game the scores stayed tight throughout. Zhao/Tian stole four points in a row from 17 all to 21-17 to keep their perfect head-to-head record intact. The last game was full of great rallies. Both pairs attacked more in the last game, but also displayed exceptional defense. Defense overcame attack and attack overcame defense, but clearly it was Zhao and Tian who came out on top in a few more of those long rallies.